After defeating the Laval Rouge et Or to become Réseau du sport étudiant du Québec champions, the Concordia Stingers travelled to Antigonish, Nova Scotia to participate in the Canadian Interuniversity Sport championship. 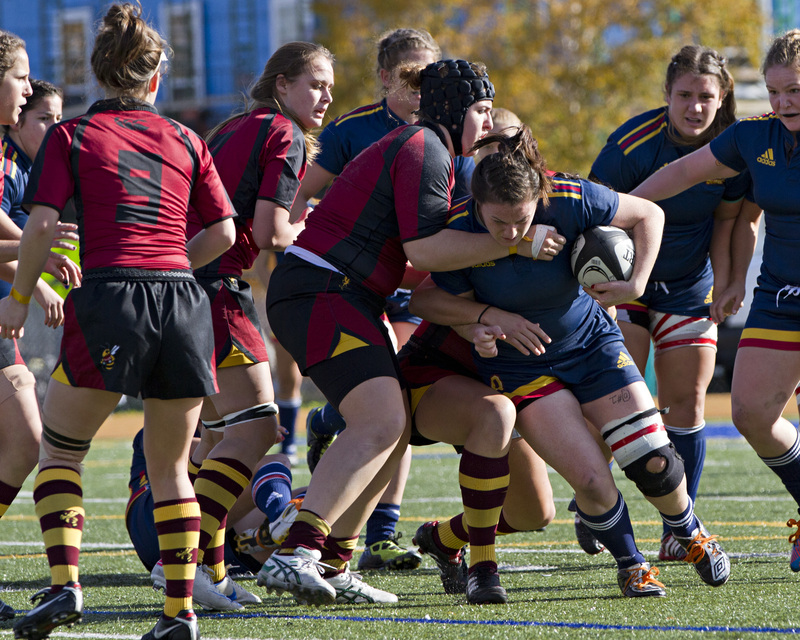 Along with the Stingers, the six team tournament included the hosts St. Francis Xavier X-Women, Alberta Pandas, Guelph Gryphons, Acadia Axewomen and Queen’s Golden Gaels. The six teams were placed in two equal groups consisting of three teams. Each team played against the other two teams of the group. Concordia was in Group B which included St. Francis Xavier and Queen’s. Myers scored an early try for the maroon and gold. Bianca Farella added two more tries to end the game. Jackie Tittley successfully converted three of the four tries and added a penalty goal in the second half. Farella was named Concordia’s Most Valuable Player. The next day, Concordia faced the X-Women for a spot in the finals. St. Francis Xavier also defeated Queen’s and therefore top spot in the group was up for grabs. Both Concordia and St. FX played each other in non-conference games earlier in the season. The X-Women won every game. They were the number one ranked team in the country. In this game, St. Francis Xavier shut out the Stingers 40-0. The home side was up by 23 at halftime and added 17 points in the second half. Despite the loss, Farella was again named MVP for Concordia. With a record of one win and one loss, the Stingers qualified for the bronze medal game. Concordia went up against the Alberta Pandas, who finished Group A with the same record. The game was played on Sunday right before the gold-medal game. Both Alberta and Concordia each converted a penalty attempt early on in the first half. The Pandas scored a late try before the break to go up seven points. With 20 minutes to play in the second half, the Stingers were within two points. Alberta scored 17 straight points to win the game 34-15 and claim the bronze medal. Farella, Tittley and Chelsea Guthrie ended the game with five points each for the Stingers. Tittley was named MVP. Concordia head coach Graeme McGravie set up objectives for his team coming into the weekend. The team’s goal was to capture at least the bronze medal. In terms of the weekend, McGravie acknowledged how hard it was to win the tournament given the demanding schedule. After an opening day win, McGravie approached the St. F-X game with caution. This was Concordia’s first time back in nationals since 2010. In that year, the Stingers made it all the way to the finals and lost to St. FX by one try. In 2009, Concordia also finished fourth place.